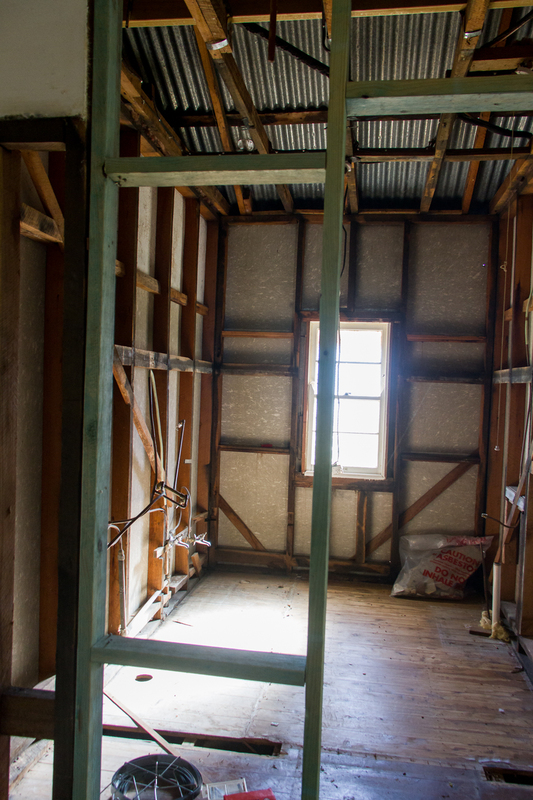 It’s never been my intention to rave on and on about our farmhouse renovation, but boy oh boy, it is looking exciting at the moment. It hasn’t been without a few little hiccups, and we have a long way to go yet, but I thought it was time I spilled the details and shared some progress pics. For those who don’t remember, our little old farmhouse has been largely unrenovated since it was built. It had a few additions and cosmetic upgrades in the 1970’s but was seriously overdue for a rewire, and some other big maintenance jobs. It had been sitting mostly empty for about 10 years before we moved here in December 2011. We also found that the room configuration gave us generous bedrooms but pokey, dark, inconvenient living areas. (Here’s a link to a super early post of photos of the house before we moved in – excuse the terrible photos and bad page layout). Fortunately, CB’s brother is an architect, and so he designed us an extension and reconfiguration to better accommodate our lifestyle. 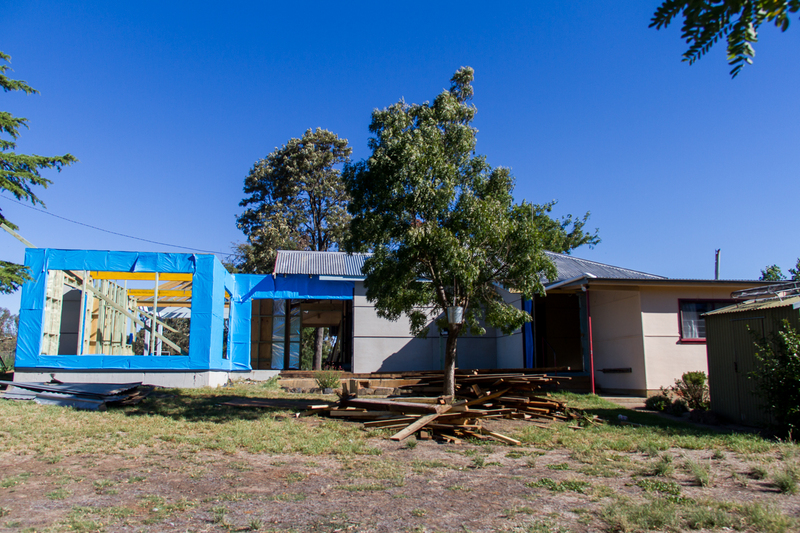 Once we started to nail down the design it became obvious that we were going to need to move out for the duration of the build. 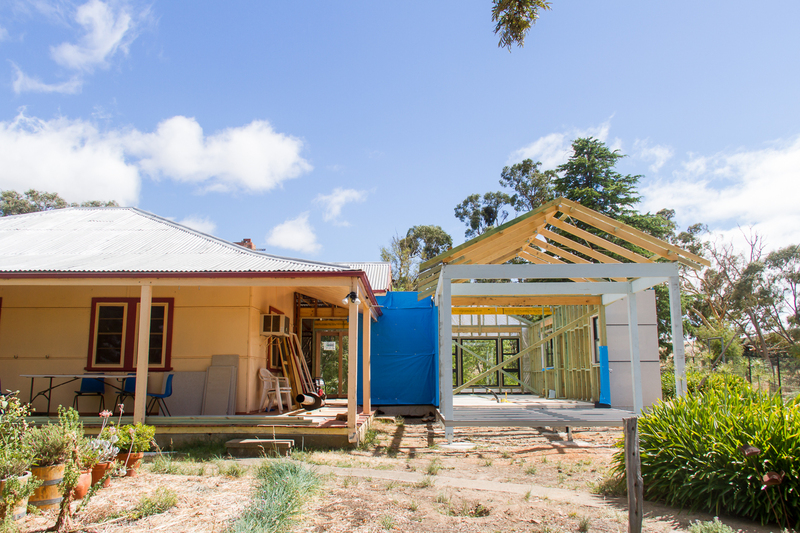 Only two rooms in the entire house are being untouched with doors being moved to create a larger bathroom, and a fourth bedroom, as well as removing the covered back veranda. You might remember that last year was a record year for rain around these parts. And all that rain caused our builder to run late from his previous job so instead of starting in late August, it was late November before he was finally ready to start with us. I can tell you it was an exercise in patience for me, and we were all super excited when the excavator finally turned up to dig the footings for the extension part. The arrival of the concrete truck to pour the slab was even more exciting. Once that had been poured, it had to cure, and that brought us to the Summer break. While the builders took their break, we packed up the entire house and moved up the road to a farm house we have rented from a family friend. 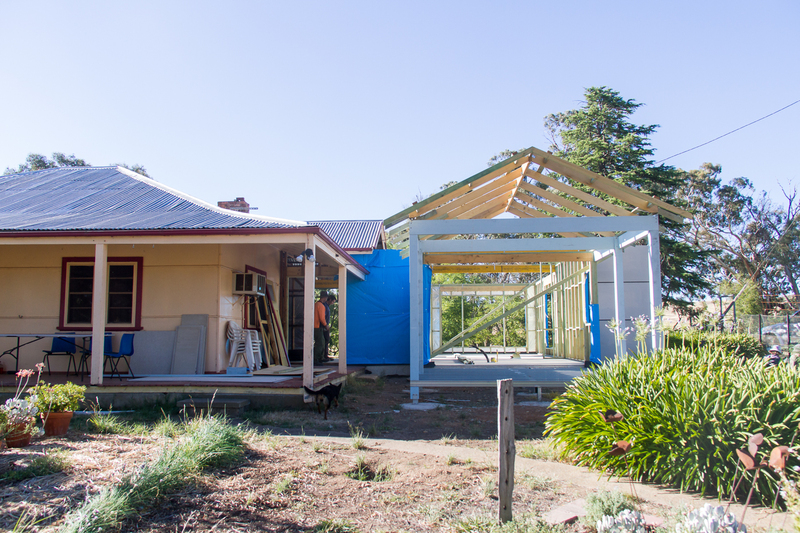 I don’t have any pics of the asbestos removal, but in one day they took off all the sheet asbestos from both inside and outside the house, and then suddenly the frames were going up, and we got a feel for what the new rooms will actually feel like. Since then it really has been all systems go. 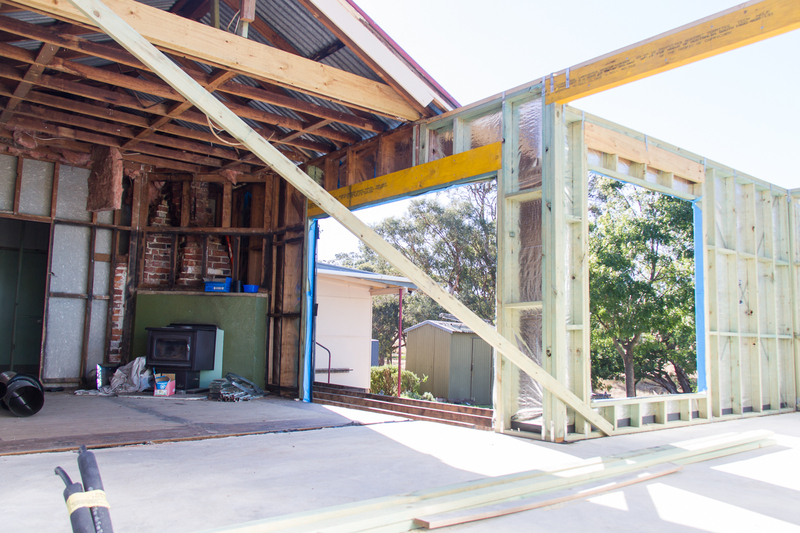 The old kitchen and bathroom were gutted, and the back veranda removed. 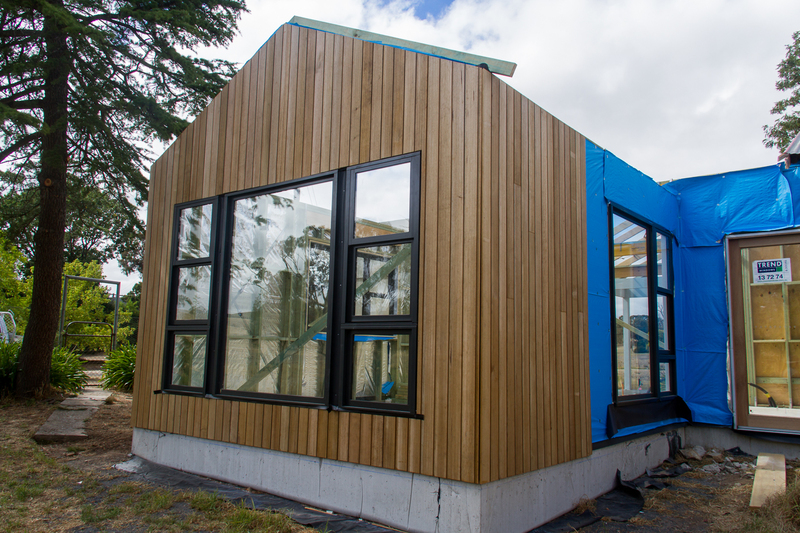 Windows and doors have arrived and been installed. 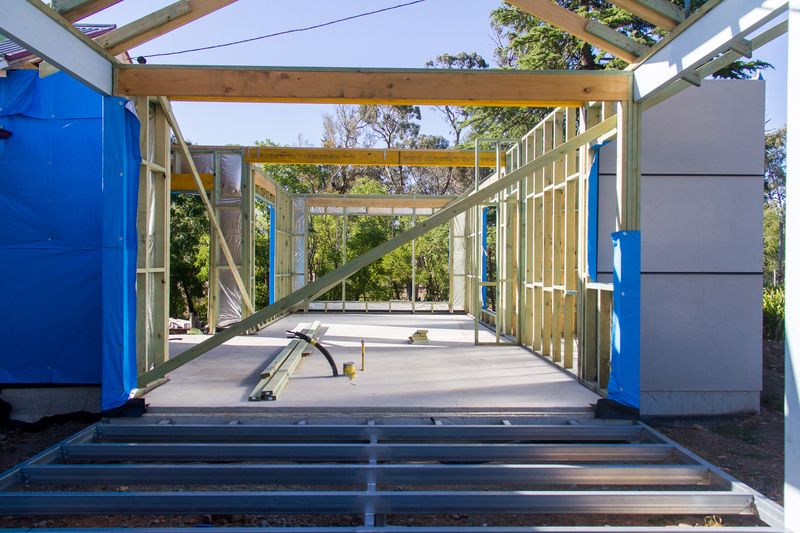 The cladding is going up as are the roof trusses. It’s all very exciting. Of course, I know that once the big jobs have been done, the changes will look less impressive, but still… super excited. In the meantime, we are living in an old farmhouse another 5 km up the road. We’ve kept most of our stuff in boxes, and because we don’t have much that we don’t use regularly, we spend time every other day looking through boxes to find something we need. The kids are missing living on our farm. They miss the animals, and their cubbies, and the freedom to do whatever they want. I’m missing the farm too. I’m actually surprised by this, as I didn’t think I would. There is still several months worth of construction to go. Electricians and plumbers, as well as a myriad of other trades all need to come and do their bit. There are lots of decisions still to make. Tiles, flooring, kitchens, bathrooms, lighting… the list goes on. In some ways, it all seems a little surreal, as though this is not really our house, and it’s not really happening. But it is our house, and it is happening. I just need exercise my patience a little longer. 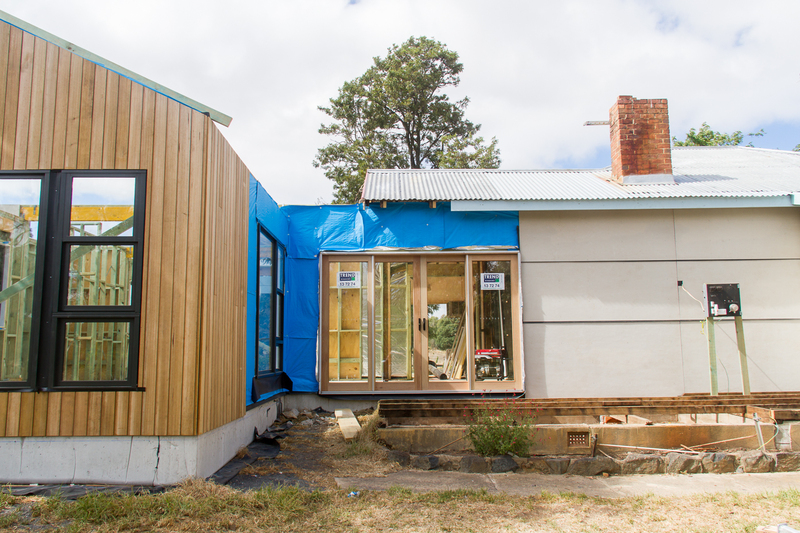 Have you ever done a major renovation or extension? Did you find it exciting? Did you ever get in there in the end? That’s so exciting! Keep the pictures and detail coming please I loved the trip down memory land to the house when you first moved in. Wow! Like a museum. Good luck with the reno, Jo. Hi Jo, great pics and great story. We just received our DA and Engineering report today for Bega. Will love to see the dirt finally dug. Kind regards, Jim. It’s so exciting when work finally begins! Very exciting…renos always take longer than expected but you won’t know yourself when it’s done and ready to move in again. Looking good.